What do apples have to do with sustainable luxury vegan fashion? One pervading thought that still lingers in people’s minds about the lifestyle is that vegan fashion is a little behind when ‘luxury’ materials like leather, suede and exotic animal skins aren’t used. This is something innovative individuals who are environmentally conscious and animal lovers are quickly picking up on and filling the gap for. I will talk more about some of my favourite brands later, but walking through Harrods recently, I noticed how apart from Stella McCartney, there were no other designer brands that were vegan friendly and without paying through the nose for luxury fashion. happy genie is looking to bridge that gap in the market. Update: I am very pleased to announce that Tanja has asked me to become one of happy genie’s brand ambassadors and I couldn’t be happier to support the brand’s efforts. It should be noted however that this post has not been endorsed or sponsored in any way at the time of writing and reflects my own opinion and support for the brand’s Kickstarter campaign. All photos and videos used in this blog post belong to and are copyright of happy genie and should not be re-used without prior permission. A lot of non-vegans commonly believed that being vegan means eating lots of salad (yes, rabbit food for vegans) and bland, flavourless meals with no nutritional value. 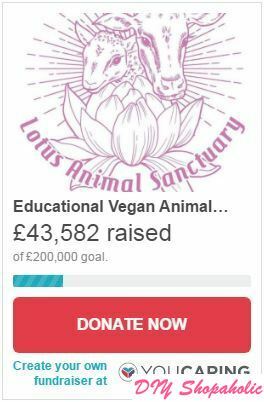 Many social media influencers, including myself, as well as vegan restaurants and food stalls, regularly post photos, information and videos to promote the vegan lifestyle. In fashion, there are other companies that offer beautiful handbags using recycled vegan friendly materials, but happy genie has come up with a genius idea. Tanja Schenker, CEO and designer for happy genie handbags, created sister brand, Genie in a Bag, 4 years ago. From this multifunctional design, Tanja then designed a collection of women’s travel and business bags 2 years later, but continued to investigate others ways in which vegan bags could be made from waste materials. 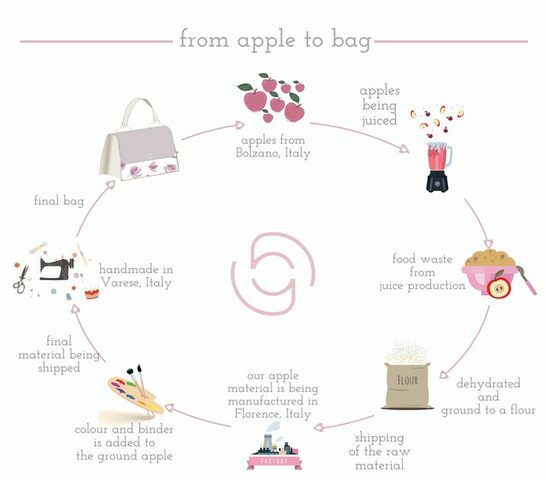 It wasn’t until she discovered vegan materials could be made from the waste in the production of apple juice in Bolzano, Italy, the waste is processed into vegan friendly materials in Florence and then handmade into beautiful luxury handbags by local craftsmen in Varese. Like Tanja, I loved fashion and the intricacies involved in finding that perfect combination between a timeless and classic design and supporting a brand that appealed to my sense of individuality. 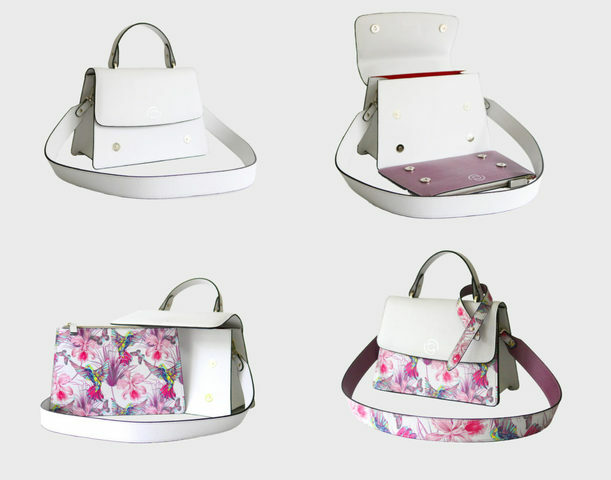 happy genie handbags are vegan friendly, ethical and above all, sustainable. Many vegans will tell you that supporting a brand (vegan or not) that exploits its workers negates the cruelty free factor of the products they promote, but at the same time not all brands are that transparent which makes it difficult sometimes for the consumer to know where to turn. 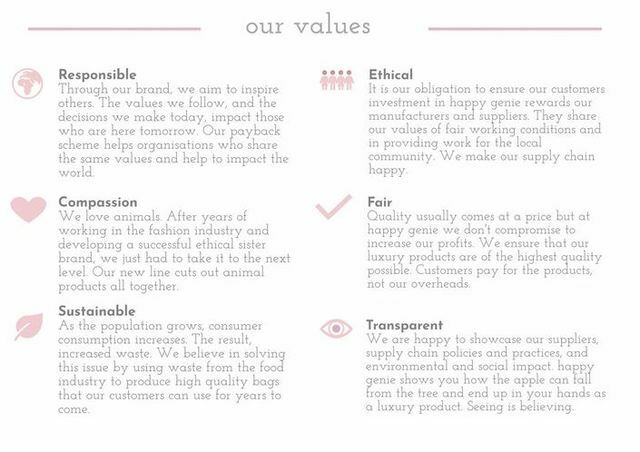 It makes consumers like me, who are also fashion conscious, relieved to know when companies declare their work and production ethics in a clear and concise way. Now to get to the good stuff. Have you ever bought a bag because you liked the design, but for a night out you would need another bag? I’d be the first to admit that I don’t have a capsule wardrobe, but the idea appeals to me in a way that means getting dressed could be so simple. It’s also an exciting prospect to discover how many outfits you can wear with just a few statement pieces! Having too much choice creates too much clutter and makes getting ready take that much longer, but I find it difficult to restrict some statement pieces to a capsule wardrobe so it hasn’t yet crossed my mind. happy genie’s handbags brings you some of that simplicity. 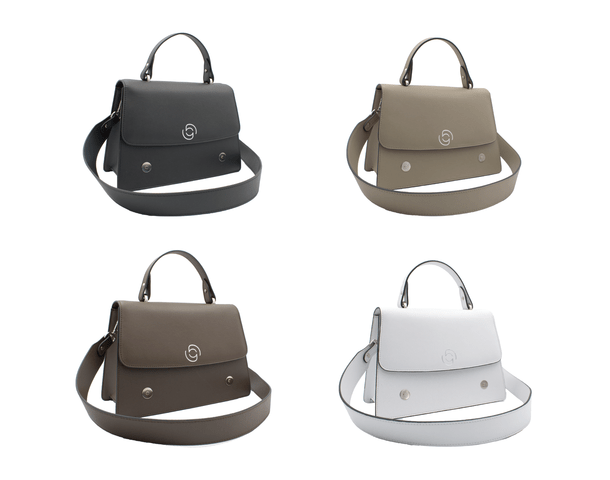 Designed in Switzerland and made in Italy, the statement handbag comes in a choice of 4 colours: black, brown, taupe or white. You can personalise your bag to suit your personality or style by changing the easily detachable strap, handle and clutch. 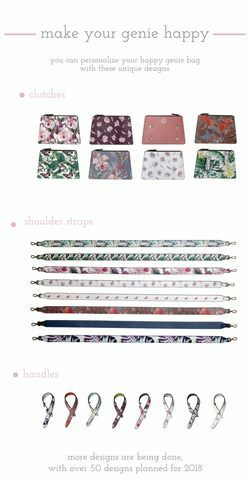 A range of 8 designs are currently available with the hopes of expanding the accessories range to 80 prints by next year once happy genie has officially launched in March 2018. The brand is currently looking for backers to support their project on Kickstarter (here) and is offering 40% off retail price when they officially launch in March 2018 for all items! For a minimum of just 5 CHF* (approximately £4). At 115 CHF* (approximately £88), you can receive a limited edition clutch, the classic bag for 345 CHF* (approximately £263) or the full set of a handbag, clutch, solid and printed handles and straps for just 570 CHF* (approximately £435). Are you a retailer looking to expand your unique collection of items for sale? The happy genie retail starter kit is only 3445 CHF* (approximately £2630) which gives you 5 sets of everything to get you started! *All prices shown are pledge categories and does not include postage which is calculated at checkout. 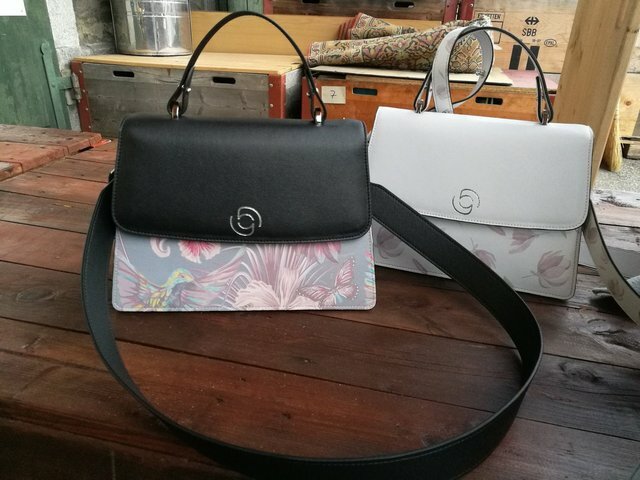 At just a fraction of the cost of luxury designer brands, happy genie offers affordable, and sustainable, luxury for the masses while also allowing customers to customise their bags to suit their personality. I really like the idea of being able to personalise one bag with different accessories instead of buying multiple bags which take up storage space and cost a lot of money. The campaign only launched on 27th October and within 2 days has already reached over half of their intended 5000 CHF (approximately £3817) target! I’m proud to be a backer of the happy genie brand of handbags and can’t wait to watch this company grow from strength to strength. If you would like to support a sustainable, cruelty free, ethical and vegan brand expand further and offer fashion forward customers luxury fashion items, please support happy genie’s Kickstarter campaign by pledging. You can find out more information and committing your pledge here. Previous Review of The Auld Hoose: home of the largest nachos in Edinburgh!